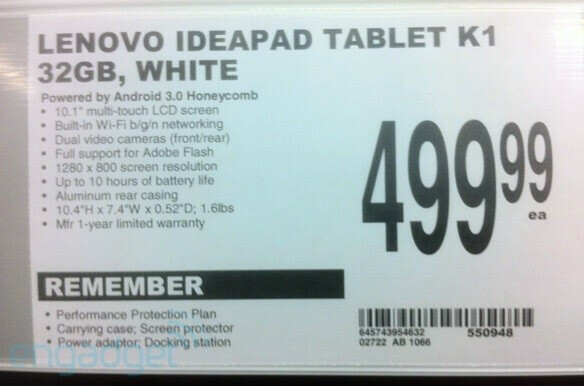 Android Honeycomb tablets are starting to hit the shelves quicker now, and Lenovo wants in on the game too. A leak shows a product listing for the upcoming Lenovo Ideapad Tablet K1, which will be coming to Office Depot and retailing for $499. Unfortunately, there is no firm release date yet. The Lenovo Ideapad K1 will be pretty much what you'd expect from a Honeycomb tablet at this point. Rumor has the processor as a Tegra 2, but the leaked listing gives the other confirmed specs: 10" (1280x800) LCD screen, 32 GB storage, front and rear cameras, full Flash support, 10 hours of battery life, an aluminum back casing, and a weight of 1.6 pounds (725g). Earlier reports also show the K1 to have a microSD card slot and a micro HDMI-out port. All that is pretty good for a tablet clocking in at $500. The one caveat here is that this will be the first Honeycomb tablet to ship with a custom UI overlay, so you will not be getting stock Android. Given that all Android tablets are following the same design scheme, we knew it wouldn't be long before custom UIs began creeping in. 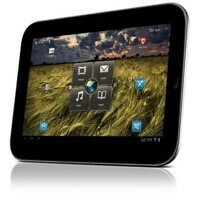 Even Samsung has said that there will be an OTA update for their Galaxy Tab 10.1 which will bring the TouchWiz UI. Custom UIs are a good way for manufacturers to differentiate and bring new features, but they are also known to considerably slow down system updates, so we'll have to see how this one works out for Lenovo. Is this the Lenovo tab that promises to have a fine point stylus for taking notes?